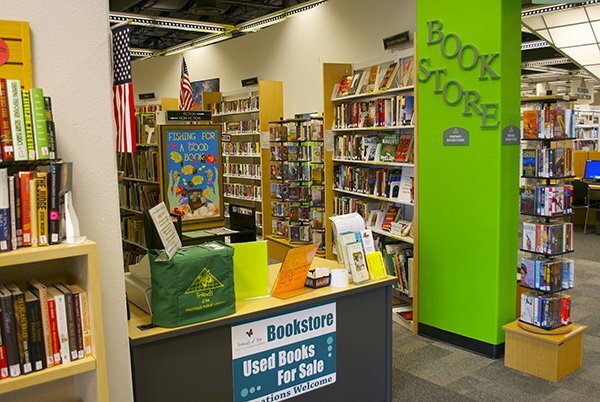 The Friends’ Bookstore, located inside the Fruitville Library, is run by the Friends of the Fruitville Public Library. We also sell rare, collectible and vintage books online through our eBay bookstore, foflbookstore. We are a top-rated book-seller on eBay, shipping books all over the world. As always, we rely on your donations of books to stock our bookstores, both in the library and through eBay. The Friends’ Bookstore in the library is staffed by dedicated, book-loving volunteers six days a week, year-round. The eBay bookstore also depends on volunteers who sort, catalog, advertise, pack, and ship purchases all over the world. Book Sales are held periodically throughout the year, but every day is Bargain Day at the Friends’ Bookstore. Members of the Friends receive email notices in advance of sales. We invite you to browse our Bookstore every time you visit the Library. You can purchase gently used hardcover and paperback books, both fiction and nonfiction, magazines, music cassettes, DVDs, CDs, audio books, children’s books and even jigsaw puzzles for surprisingly low prices. New inventory is added each day. You never know what you will find on the shelves which contain more than 4,500 books and media. You can also become a member of the Friends while you are there, as well as receive information on upcoming programs and events. Proceeds from the sale of books, plus membership dues and donations provide extra services, materials, equipment, programs and enhancements for the Fruitville Public Library not included in the Library budget. Donations of gently used books are greatly appreciated: What a great way to recycle books AND support a great cause.